This ring is simple, but fun. 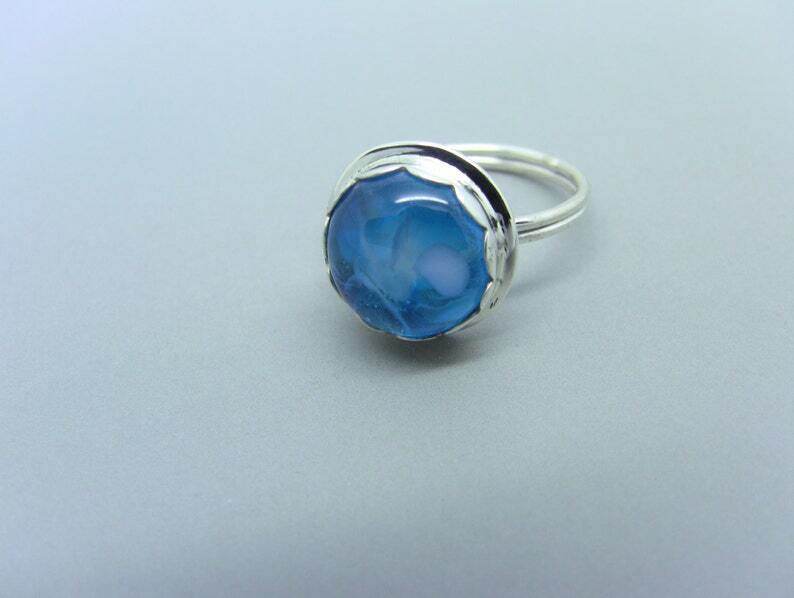 A 3mm wide sterling silver double wire band is attached to a silver bezel cup which holds a blue fused glass cab. The blue glass has a marbled effect from being fused with white and clear glass fragments. I hand forged/hand crafted it using silversmithing techniques such as sawing, filing, and soldering, etc. Ring size is 6-1/2 and has been work-hardened and polished in a tumbler. The fused glass cab is about 13mm in diameter. I cut and fuse all the glass products that I sell in a kiln, in my studio (a makeshift section of our garage). Each one is made of multiple layers of glass and is kiln annealed for strength. No glass cab will be exactly the same which gives each a unique touch. This necklace is perfect to go with a pair of earrings I got for Christmas! It's very well made and was received very quickly. It's delicate, but will show up nicely with an outfit I have. Thank you very much! Very beautiful it person. I love it! Thank you! Got this as a Christmas present for a family member, the hair clips are gorgeous, thank you so much, also a great price. Very sturdy and shiny. I liked these clips so much, that I have ordered 4. They hold my hair well and they are sturdy and pretty too. Packaged beautifully too. We accept payments through PayPal and Etsy. Payment required within three days. The item will not ship until payment has cleared. Residents of Idaho must pay 6% Idaho sales tax. This will automatically be calculated for you as long as the shipping address you submit is located in Idaho. We hope that you will love your jewelry purchase, but if you don't like the piece you may return it within seven business days. The item must be returned in its original, undamaged, and unused condition. Please contact me to notify me of your intent to return the item so that we can make arrangements. It is the purchaser's responsibility to make sure the item is packaged securely and arrives safely. For this reason we recommend insuring your item. Once we receive the item back in undamaged condition we will issue a refund or exchange for the item. No refunds or exchanges are allowed on custom orders. Sorry, no refunds for shipping charges. Also if you are not satisfied with your items please send me a message before posting neutral or negative feedback. I would love the opportunity to resolve the situation and make you happy. After processing your order through PayPal, your order will be prepared for shipping as soon as possible. We generally ship within 2 business days. If for some reason we cannot ship within 2 business days we will contact you via e-mail. Most items will be shipped through the US Postal Service. If you prefer to have your item shipped another way, please contact me and I can send you rates. Once the package is sent through the mail, we can no longer be responsible for it. We highly recommend purchasing shipping insurance in case your item is lost in transit. If you would like insurance added, please convo me before paying and I will send you a revised invoice. Please make sure your paypal address matches the address you want your items delivered to. It is against PayPal's policies to deliver to any other address. If you wish to ship an item to a different address please convo me or pay through Etsy. If you would like your purchase to be wrapped in a special way, please contact me and I would be happy to accommadate your request for a small minimal fee. I will even throw in a gift card free of charge. I can also do custom orders. If you are looking for something and cannot find it, please let me know.